This article describes the three methods for making a graphic partially transparent. Such graphics are often used on templates as borders and frames or whenever a blending result is result is required between the graphic and other objects on the template. There three ways of achieving transparency. When the graphic is imported into the software, either directly onto the template or into a file or folder field, the user has the option of clicking on any color in order to make that color transparent. Only pixels with precisely the same RGB values will be removed. As a result any edges where the colors are not "pure" (as would occur when using jpeg compression for example) will not become completely transparent and fringing occurs. This is most often displayed as white flicks or specs and is compounded when edges are softened by the use of anti-aliasing, feathering, drop shadows and the like. For these reasons the one bit transparency support while very convenient is generally only used with graphics with "clean" edges. 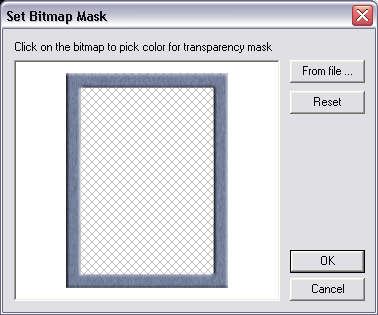 A more powerful method of achieving transparency is to use an image editor such as Adobe PhotoshopTM to create an 8-bit transparency mask. With such a mask areas of the mask that are 100% black will be completely transparent. Any areas of the mask that are 100% white will be completely opaque. The remaining 254 shades of grey provide varying degrees of transparency/opacity. 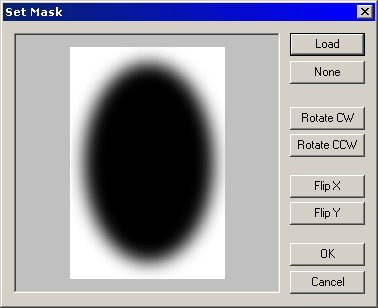 The use of 8-bit masks to achieve transparency has been somewhat superseded by direct transparency support with png files as described in method three below. The most popular method for adding transparency to a graphic is to create the graphic with the desired transparency already in tact (using an external image editor such as Photoshop). The graphic is then added to the template or imported into a field as normal.